Last Saturday, me and Min Young went along bus number 23 (blue bus) route from Dong Incheon station, Line 1 to Wolmido Amusement Park. Although I have stayed in Dong Incheon for about 7 months but not even one day that I spent exploring the place. 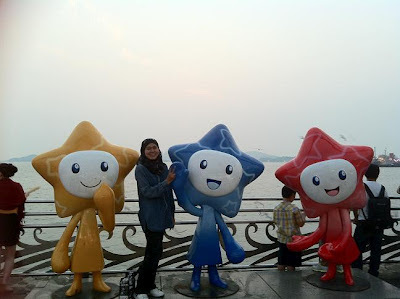 Anyway, summer is coming soon..I mean the real blazing hot and I'm not wandering as Malaysia is always like that. Nowadays weather wise, it's cool during the early morning and at night ranging from 20 degree celcius. At noon, it's better to stay inside. We strolled along the coast after 5pm, standing there for an hour or so staring at the sea while chit chatting about our bleak future..haha. I'm gonna be lonelier than ever while staying in a rat hole alone! The theme park is not much to brag about but they have like 3 vikings with extreme swing angle. I actually rode one but that was after eating the most unappetizing 쫄면 ever. Don't ever try the restaurants in front of Wolmido Amusement Park. They are expensive and not tasty!!! 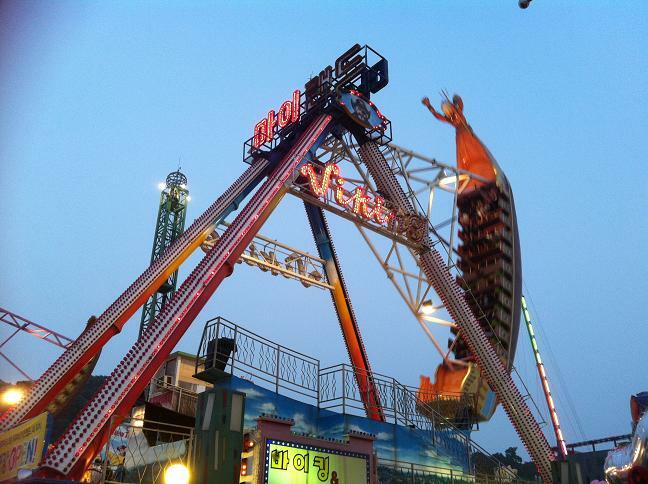 I do love extreme rides and the viking is kinda worth my 4,500won but my stomach was not behaving so well after eating it and I was kinda disappointed that I couldn't enjoy the viking ride fully. While taking the bus, it passed by Incheon Chinatown so I think it's not so far if you walk to or fro Wolmido Amusement Park. Or just take the bus if it's in summer..hehe. I saw one hilarious game; Apollo Disco where the DJ will spin it according to his will but Min Young said that your whole arm will be so painful and you could not lift it the next day! So I didn't dare to try but I had a good laugh while watching others riding it. Try the games there if you have more time to kill. How to go to Wolmido Amusement Park? Take subway to Incheon Station, Line 1. After that take bus number 2 or 23 or 45. Wolmido is the last station.